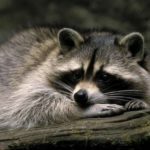 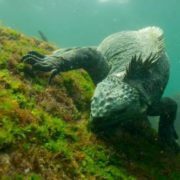 They live in trees, holes, burrows, and among rocks. 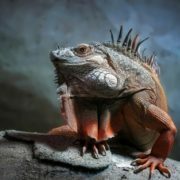 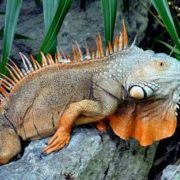 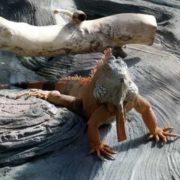 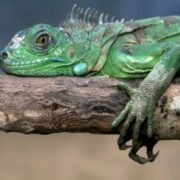 Iguanas are assigned to seven genera, their common names being banded iguanas, land iguanas, spiny-tailed iguanas, ground iguanas, desert iguanas, green iguanas, marine iguanas and chuckwallas. 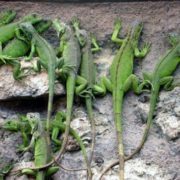 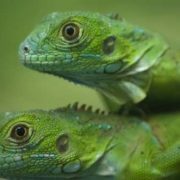 Seven to 12 weeks after mating, the green iguana lays 20 to 30 eggs, each about 4 cm long. 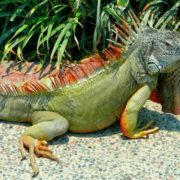 The banded iguana lays three to six eggs, each about 3 cm long. 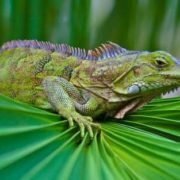 The banded iguana is unique in that egg incubation takes an unusually long five to eight months. 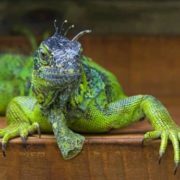 The Fiji banded iguana is so–named because males of the species have pale, bluish–green bands covering their green bodies. 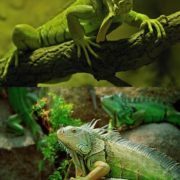 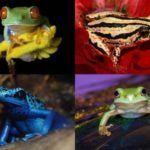 Their skin color changes in response to light, temperature, and mood. 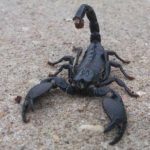 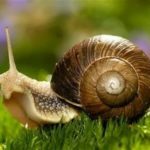 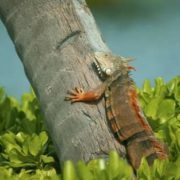 They are about 19 centimeters long and their tail measure two to three times their body length. 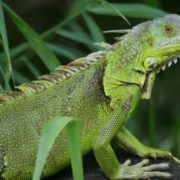 The Fiji banded iguana lives on various islands that are a part of the island nations of Fiji, Tonga, and Vanuatu in the southwest Pacific Ocean. 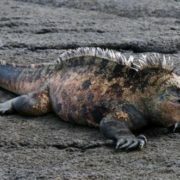 The Galapagos land iguana is a large iguana with a stout body. 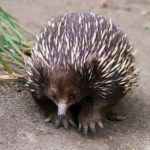 They reach a length of almost 1.2 meters and weigh an average of about 7 kilograms. 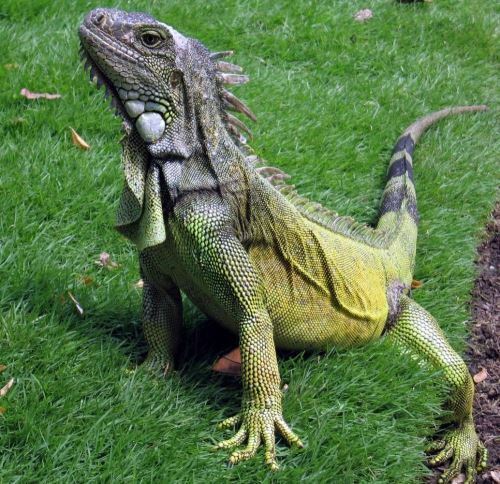 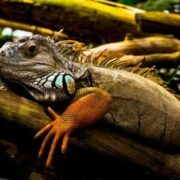 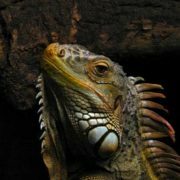 This iguana is yellowish–brown in color with patches of black, brown, and rust. 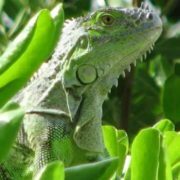 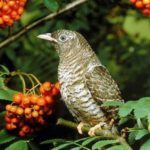 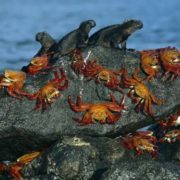 They prefer dry areas on the islands they inhabit. 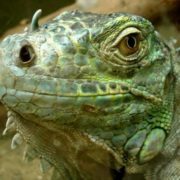 People keep them as pets and in rural areas people eat them. 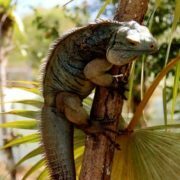 Cats, large birds, and other animals also eat young iguanas and their eggs. 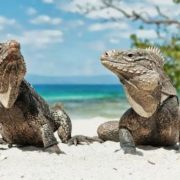 Iguanas may live up to 40 years.